The recent Israeli airstrikes outside of Damascus have refocused the United States' attention on the Syrian civil war. In the wake of the attacks, the phrases – "red line," "game-changer," and "enormous consequences" – have permeated the lexicon of the conflict, with each resonating differently in Washington and Jerusalem. In the U.S., the "red line" was thought to represent the point at which the White House would step off the sideline and act decisively to bring the conflict to an end. After several attempts at throwing down the gauntlet, President Barrack Obama finally placed it at Syria's use of chemical weapons. Were they to be used, he said, it would be a "game changer" and those that used them would be met with "enormous consequences." But it turned out, as Senator John McCain pointed out last weekend, that Obama drew his "red line" in disappearing ink. Likewise, the game didn't really change. There is no kinetic response the president is considering that spells the difference between, say, European football and full-contact American football. Instead, the White House treated Americans to a fresh presidential vacillation when a senior aide to President Obama revealed to the New York Times that the term "red line" was an off-the-cuff remark that took his advisors by surprise. The idea that the president was ad-libbing American foreign policy came as a shock to many inside Washington. That notion likely compelled Obama to clear the air the following day through his press secretary, Jay Carney, who stated that the president really meant to use the phrase, "red line." However, he continued, the president "has never said what reaction he would take at a policy level to the proved crossing of the red line in Syria." While that may be true, on August 20, 2012, Mr. Obama clearly stated that crossing the "red line" would result in "enormous consequences." Now, just over a week after conceding that chemical weapons were used in Syria, the White House has been downplaying that phrase, which apparently amounted to presidential hyperbole on foreign policy matters vital to the interests of the United States. If the verbal gymnastics from the Obama administration left analysts and journalists confused as they pondered the range of possible consequences, it was with good reason. After all, "serious consequences" were promised if Saddam Hussein did not comply when the UN Security Council adopted Resolution 1441 in 2002 and the consequence was the U.S.-led coalition that invaded Iraq a few months later. To be sure, President George W. Bush promised "shock and awe," lest there remain any doubt about his seriousness. And surely by definition, "enormous consequences" conjures something even larger than "serious consequences." But it appears the president has no desire to increase America's role in Syria or to fulfill his August 2011 policy pronouncement that called for Bashar Assad to "step aside." In Israel, these key phrases have a different connotation. With regard to Syria, Israel has a "red line" in preventing the transfer of advanced weapons systems – including weapons of mass destruction – to Hezbollah. To that end, it is believed that Israel carried out an airstrike in January that targeted SA-17 surface-to-air missile (SAM) batteries. They were provided by Russia, sent to Syria, and destined for Hezbollah. Last week it is thought that Israel attacked Syrian facilities holding Fateh-110 ballistic missiles provided by Iran. The SA-17 would have been Hezbollah's only multi-targeting anti-aircraft system and the Fateh-110 missiles would put Tel Aviv in range of South Lebanon. If the rumors are true that Russia is gearing up to send Assad the even more advanced S-300 SAM system, it would present a challenge to any modern air force. In Israel's thinking, these weapons constitute a "game-changer" in terms of the threats facing the Jewish state from the north. Accordingly, Jerusalem enforces its "red line." Likewise, successive Israeli governments had lines for the acquisition of nuclear weapons by hostile Middle East states. 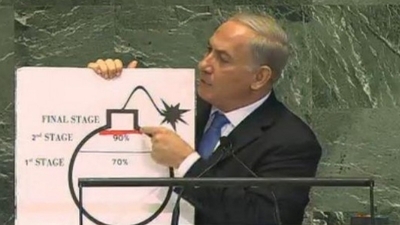 Netanyahu literally drew a "red line" on a cartoon-like drawing of a bomb when he addressed the UN General Assembly in September 2012. He indicated that if Iran amassed enough uranium purified to 20 percent, then the Islamic Republic would be 90 percent along the path of having sufficient weapons-grade material – something Jerusalem will not tolerate. In this sphere, Israel also has a record of imposing "enormous consequences" when its "red lines" are crossed in the pursuit of "game-changing" nuclear weapons. The Israeli Air Force destroyed Iraq's Osirak nuclear reactor in June 1981 and Syria's al-Kibar nuclear facility in September 2007. Contrast that with both words and deeds from the Obama administration. "I've stated repeatedly, publicly that red line, and that is we're not going to accept Iran having a nuclear weapon," President Obama said in a September 2012 interview with Telemundo. "I've been very clear about my position." But the administration has long suffered from mixed messaging on Iran; Syria is merely the latest example. It's more than a matter of words. Israel understands the strategic environment in which it operates. By altering the rules of engagement in Syria, it ensures the balance of power does not shift in Iran's favor with the transfer of advanced weapons to Hezbollah. Israel can punish Iran and its network in Syria. No such strategic clarity is forthcoming from the White House, where "red lines" are not "game-changers" and consequences seem paltry, as the administration appears bogged down in details and process. All of which augurs poorly for security guarantees Team Obama offers Israel. At a time when Israel requires a steadfast ally in America, those looking for "shock and awe" may be left with shock and disappointment.